Alter Bridge vocalist Myles Kennedy has a been a journeyman in rock music for a long time, but his profile really took off after Slash asked him to be a part of his first solo album. This is his first full attempt to strike out on his own without the bands that put him in the spotlight. The first noticeable thing is its laid back nature. The title track is an acoustic guitar driven song that comes very close to an alt-country feel. Not expected but really fitting to the subject matter at hand. Follow up ‘The Great Beyond’ pushes the musical experimentation further, adding more strings to the landscape as it weaves its hard rock-filtered- through-an-Americana soundtrack as Kennedy continues to purge the personal demons he wrote the album to tackle. As the album continues in the shadow of its own darkness mixing country/blues and Americana to great effect, the singer contains his usual bombastic vocal style for a more lamented performance. The bluesy ‘Devil on the Wall’ really stands out while ‘Turning Stones’ celebrates his childhood memories as a lap steel sits delicately beneath the surface, pushing the song toward another good guitar driven crescendo. Kennedy has stated in recent interviews that what he intended with this album is a purging of his family history. Losing his father at a young age due to curable illness (his parents were Christian Scientists, people who believe prayer will heal disease), the story is told from his perspective and about how he feels his mother went through with his Father’s passing. As Year of the Tiger pushes through the raw emotion that has been poured in, it also audibly crosses a turning point as the mood lifts toward its close with ‘Mother’ and ‘Love Can Only Heal’ being late album standouts. I honestly had no expectation going into this, never having really investigated Alter Bridge or any of Myles Kennedy’s other musical output beyond what is readily available. 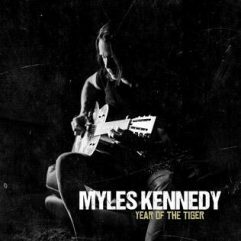 Year of the Tiger is a great insight into a man’s upbringing to a soundtrack made for relaxing away from the chaos bought on by modern living.